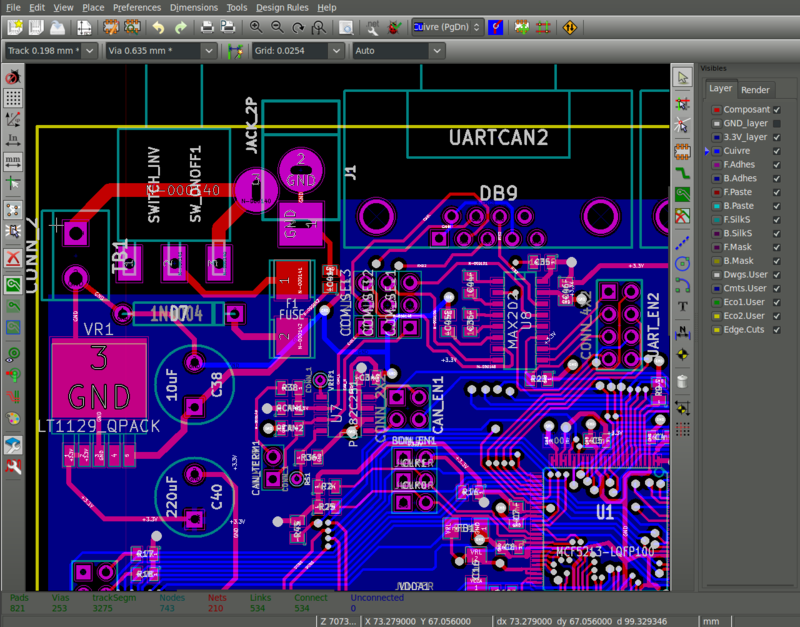 Currently the burden of managing redraws in KiCad falls on editing tools. For example, while routing a track, the tool code must take care of erasing the old trace, painting over the new one and making sure that there will be no rubbish on the screen when the view is panned or zoomed. This may introduce some difficulties in bug fixing or creating new code, as the developer has to think of drawing routines instead of focusing on the tool functionality. Splitting drawing functionality into a few abstraction layers has a few advantages. One class (PAINTER) takes the responsibility for drawing items using a basic command set. For example, to draw a via you need to draw two circles: first makes for a via itself and second represents its hole. The PAINTER gets information about an item (like diameters of via & its hole) and uses the backend (the GAL class and its derivatives) to draw it. That means that you can use any library to do the drawing tasks and the result should always look exactly the same. This kind of a division of tasks makes it easy to add new rendering backends. Right now, there is a plan to use two types of backends. The Cairo backend is going to be used for drawing vector graphics, which is very useful in creating documents, but at the cost of performance. In that case usually it does not matter if it takes a few milliseconds or a few seconds to prepare a document. The second backend is going to be based on OpenGL. Its main purpose is to boost the rendering speed, so even quite complex board can be rendered without a performance drop. It can take an advantage of commonly available modern graphic cards, in opposite to the default KiCad software rendering engine relying only on CPU speed. It is a good idea to use the most complex board available to test it out and see the performance difference. If you want, you may try it out with a 12 copper layers PCB (please do not pay attention to the wrongly placed labels, the plugin we used to import the board is incomplete). The Graphics Abstraction Layer code is already merged to the product branch. 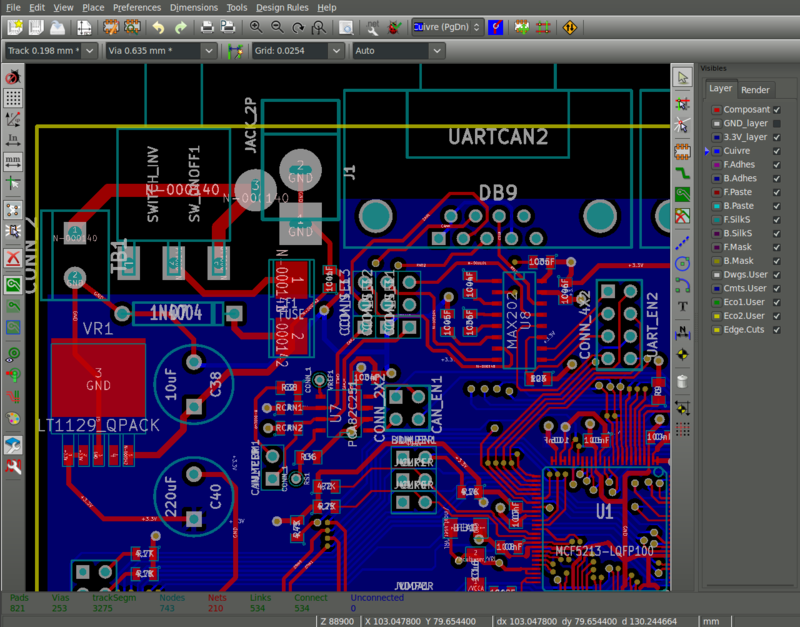 To take it for a test drive, simply build KiCad using the official instructions.